KINDERGARTEN REGISTRATION: Kindergarten Registration Week for the 2017-2018 academic year will take place from Monday, February 6 to Friday, February 10. If one child from a family is already enrolled in a particular school, a sibling registration period will take place a week earlier. Parents are asked to register at the EMSB elementary school nearest to their residence, offering the French program of their choice. For more information please call (514) 483-7200, extension EMSB (3672) or log on to the Board’s website at www.emsb.qc.ca. All pupils registering for the first time are required to provide a birth certificate and vaccination records to the school the child will be attending. Parents will be asked to fill out forms which will allow the school to apply for the certificate of eligibility for English schooling. Under the Charter of the French Language, a certificate of eligibility is generally granted to children who did the majority of their elementary or secondary studies in English in Canada; whose mother or father did the majority of his/her elementary studies in English in Canada or whose brother or sister did the majority of his/her elementary or secondary studies in English in Canada. As a result of language legislation, this criteria excludes studies completed in the Quebec Private School system. FULL STEAM AHEAD: The EMSB has announced plans to expand its very successful pilot project run of the STEAM program, touting it as the future of how to teach Science. “STEAM” stands for Science, Technology, Engineering, Arts and Mathematics. It represents a multi-disciplinary initiative that promotes creativity and high levels of student engagement, as they perform a series of group projects that not only involve five school subject domains, but also makes them more relevant, creative, discovery-based and interesting for students. EMSB officials and guests celebrate the success of STEAM. STEAM is subject-specific learning. It aims to foster inquiring minds, logical reasoning, and collaboration skills. For the 2016-17 academic year, two elementary schools - General Vanier in St. Léonard and Pierre Elliott Trudeau in Rosemount - have been successfully piloting the program. EMSB Chairman Angela Mancini has announced that at least a dozen schools want to bring STEAM into their buildings as early as next year. The EMSB has also invited experts in the fields of Science, Technology, Engineering, Arts and Mathematics to serve as official STEAM ambassadors. These individuals have agreed to visit EMSB STEAM classrooms to share their experiences. EMSB Director General Ann Marie Matheson shares in the student enthusiam for STEAM. Popular in schools in China, India and the United States, STEAM engages students in a hands-on, trial and error basis by involving them in a series of interactive projects that integrate the five educational disciplines that make up the STEAM acronym, using the latest technological devices and the most simplest of building materials. The projects involve the students in a group dynamic, as they work together by conceptualizing, communicating, collaborating and building within authentic situations that are given to them by their teacher. In turn, they figure out together how things work by actions, by bringing out a more reality-based approach into the classroom. As a result, these STEAM projects foster not only communication, conceptualization and collaboration, but also curiosity, creativity and critical thinking. 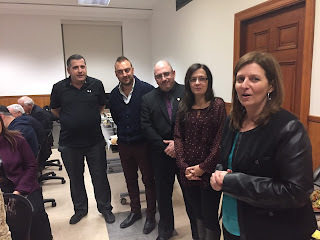 During the pilot project period, the EMSB has employed three of its educational consultants as STEAM leaders for the two schools in question: Sara Iatauro, who is the science consultant for the elementary schools; Nicolas Doyon, who is the arts consultant; and Chad Leblanc, who is the elementary mathematics consultant. They visit the two schools on a weekly basis to lead STEAM exercises with its students and discuss the mechanics of the program with its teachers and administrators. See our detailed press release and go to www.emsb.qc.ca/steam for more information. See this Montreal Gazette story. Stay tuned to local media for much more coverage. STEAM AMBASSADORS: At a press conference at General Vanier to talk about STEAM, former astronaut and present-day Federal Minister of Transport and Liberal Member of Parliament for NDG-Westmount Marc Garneau was among the STEAM ambassadors introduced. Also included were several media weather forecasters who use Science and the Arts to carry out their duties: Lori Graham, (CTV); Anthony Farnell, (Global TV); Eramelinda Boquer, (CJAD), Sabrina Marandola, (CBC), Rejean Ouimet (Meteomedia) and Catherine Verdon Diamond, (Breakfast TV). Other ambassadors on hand for the event were Annie Savard, McGill University (Math); student Steven Dahdah, McGill University (Engineering); and Kathryn Westoll and Mike Payette from Geordie Theatre Productions (Arts). Members of the LEARN team at the press conference. students, parents and partners in our community to cultivate success for all learners. LEARN has played an important role in assisting the EMSB pilot the STEAM program. One of the main goals of LEARN’s Open Creative Space/STEAM initiative is to help educators foster student engagement through active learning with high and low-tech materials. This can include, but is not limited to programming, using microcontrollers, robotics, constructing with cardboard, working with e-textiles and paper circuits, as well as designing and creating simple machines. More importantly, an emphasis is placed on the process of design, creation and collaboration and the maker mindset. It’s not really about the product, but about the learning that is happening throughout the process and the reflection on the learning, for both the teachers and the students. See the full press release. GENERAL VANIER'S STEAM: About a year ago, the EMSB’s Director of Education and Technology Services (ETS) Sandra Furfaro proposed that General Vanier Elementary School in St. Léonard try out a new hands-on educational initiative as a pilot project that would help bring it into the 21st century. 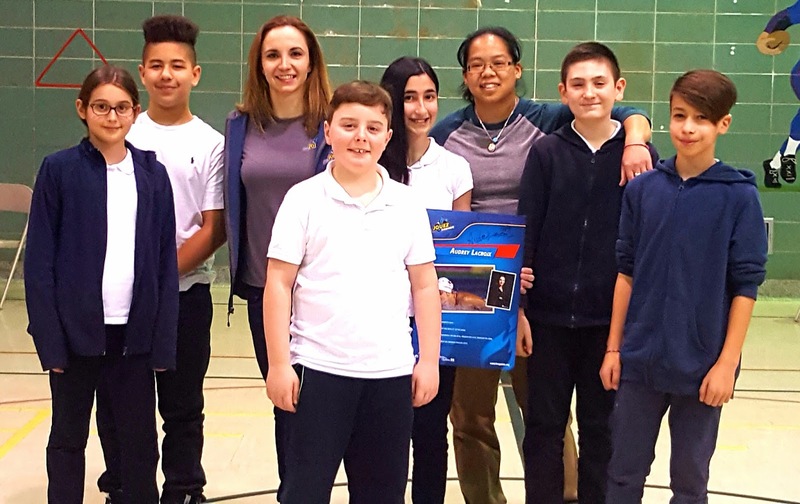 “When I first heard about STEAM, I wanted to make sure that we moved quickly so that everyone in the school would say yes to it,” said Joseph Schembri, the Principal of General Vanier School. “I presented the idea to the staff council, who in turn presented it to the entire staff, and they approved it unanimously. From there we proposed it to the school’s governing board, who also unanimously approved to initiate the STEAM program here.” Mr. Schembri is confident that once the STEAM trial period concludes next spring, and following an evaluation by the school, that it will continue afterwards. He is also hopeful that the success of STEAM so far at General Vanier will translate to an increase in enrolment. See the full press release. Trudeau students and their robot. TRUDEAU SOARS: There is one thing that you can’t help notice the moment you enter Pierre Elliott Trudeau Elementary School in Rosemount … STEAM is in the air. Whether it was from the Makerspace or any of the classrooms, there is a constant buzz of activity, as students enthusiastically work on different projects or exercises that were related to STEAM .“What I like about STEAM is that the students learn about responsibility and how to work together as a team,” said Grade 6 teacher Jennifer Lacroix. “They also learn about problem solving, engagement and risk taking, so that they can try something 500 ways in order to come to a solution. Most importantly, they are learning at an early age the necessary skills that they will need for the world that they are going into, because you don’t know what kind of jobs are going to be available when they enter the workforce.” Ms. Lacroix noted that since STEAM was introduced at Pierre Elliott Trudeau School back in September, reactions from the students to the STEAM program and the maker space have been very positive. “They are excited every time they go to the maker space,” she said. “I love seeing the big smiles on their faces when they do these exercises, because it allows for their creativity to come out, and the opportunity to figure things out for themselves by doing hands-on activities.” See the full press release. Jennifer Lacroix and a student will be on Global TV's Focus Montreal Program, airing the weekend of February 3, to talk about STEAM. Wendy Singer, Angela Mancini, Gail Callendar, Peter Tsatoumas, Julien Feldman and Ann Marie Matheson. TEACHER RECOGNIZED: When a student is admitted to the Montreal Children’s Hospital (MCH) of the McGill University Health Centre (MUHC), be it for a short or long term stay, they can count on their educational needs being met. The EMSB’s Child Life and School Services team consists of two special education teachers who keep EMSB and English-language students from other boards and schools in the academic loop. The school range covers kindergarten to Grade 11 students, both in mainstream and special needs programs, from near and far. Dynamic Funds Teacher of Inspiration 2016 Peter Tsatoumas has been a member of this team since August 2015, and has worked on the team in previous years. Devoted to the patient-students that he teaches at the MCH, he describes his work as emotionally charged and highly rewarding. He teaches some students in medical wards, but predominantly attends to those who are admitted for mental health issues. Peter has worked with students with autism and special needs at Paul VI/L.I.N.K.S. High School, and Edward Murphy Elementary. You can read the complete article on Peter in the most recent edition of Inspirations Newspaper. See page 13 at this link. Mr. Tsatoumas was recognized at the last Council of Commissioners meeting. Inspirations Managing Editor Wendy Singer made a special presentation in the company of Principal Gail Callendar and EMSB officials. Some members of the choir with Honoré-Mercier staff are thanked by EMSB officials. CBC MUSIC CHALLENGE: Last October, music teacher George Anthopoulos and arts teacher Matthew Balanca-Rodrigues from Honoré Mercier Elementary School in St. Leonard entered the CBC Music Challenge. The project was open to Grades 4, 5 and 6 students. Over 30 students practiced three to four times a week during their lunch time for one month. They produced a video of their performance of the song "2 Heads" which they sang in three languages, - English, French and Italian - to represent the school community. The group made it to the CBC short list as top 10 across Canada in the category Elementary School with Vocal. Their effort and determination paid off as they won first prize in their category! One judge commented: "I loved their fearlessness, the fact that they practiced in and out of school, and that they incorporated three languages into the mix-that is extremely impressive." Mr. Anthopoulos and Mr. Matthew attended the last Council meeting with some choir group students. They described their experiences throughout the music challenge and present their award winning video. HISTORY CURRICULUM (CBC REPORT): The EMSB is asking Quebec's education minister to delay the implementation of a controversial new history course until changes are made to include the contributions of Indigenous, allophone and anglophone people. The new curriculum, which remains in the pilot phase, spans both Secondary III and IV. It runs chronologically from the 1500s to today. It has been met with criticism for its failure to reflect the province's diversity. "Our big concern is with the content of the program," said Joseph Lalla, the commissioner who put forward a motion on the matter. "We hope that this will be corrected very quickly." The EMSB is asking that a minimum of 20 per cent of the content of the course be devoted to Indigenous, allophone and anglophone people. The motion also asks that the final approval of the curriculum be delayed by another year. The Secondary III portion of the course was originally slated to be in classrooms across the province last fall, after it was tested out in some 30 schools in 2015-2016. However, Education Minister Sébastien Proulx decided last May to keep it in the pilot phase for another year with a promise to make the curriculum more inclusive. He later said the changes would only be minor and that any school wishing to use the new pilot curriculum could do so. As a result, many school boards, including the EMSB, opted to use the Secondary III course this year, with new textbooks already printed and training days for teachers on offer. The Secondary IV portion of the course is expected to be more widely tested out next year, as students move on to the second half of the course. The board surveyed its history teachers piloting the Secondary III course and 68 per cent of them indicated there should be more content on Indigenous people. Lalla also noted that English students aren't being provided with the same material as French students. "Students who are following the course in French have access to a workbook – which are quite common in most of the courses," said Lalla. "But in the English schools, there is no equivalent workbook." See this CTV report. PARENTS VOTE: EMSB Chairman Angela Mancini says that history was made for parents at the last Council of Commissioners meeting on January 25. As part of Bill 105, adopted by the Quebec National Assembly in December, parent commissioners now have full voting privileges. In a brief presented last year on Bill 86, legislation which would have abolished elected commissioners had it been adopted, the EMSB recommended that parent commissioners be legally vested with all of the rights, responsibilities and duties of commissioners elected through universal suffrage, including the right to vote. The EMSB is governed by a chairman and 10 elected commissioners. There are four parent commissioners who were just elected for two year terms by the Central Parents Committee. They are Jason Trudeau (elementary), Mario Bentrovato (high school), Joanne Charron (special needs) and Norm Gharibian (no designation). Chairman Mancini and the four parent commissioners. 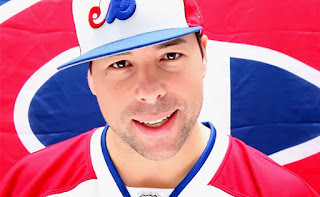 BLACK HISTORY MONTH: To mark Black History Month in February at the EMSB, rapper Annakin Slayd will lead a series of sessions on baseball legend Jackie Robinson and Montreal at a number of schools. Robinson broke the colour barrier in professional baseball. Annakin Slayd is the stage name for Andrew Farrar, who grew up in Chomedey and graduated from Western Laval High School in 1995. In 2011 he worked with the Quebec English School Boards Association on their “Go Publique” marketing campaign, producing, directing and starring in a music video aimed at boosting enrolment. At each school Slayd will make a three-part presentation of about 50 minutes highlighted by a screening of the PBS Mountainview piece “Jackie Robinson’s Montreal Connection” and his hit video with singer Leesa Mackey. Using pictures and video about Jackie Robinson and his accomplishments in the world of baseball and through the Civil rights Movement, Slayd will expand with an examination of his time in Montreal and the legacy that has endured in our city, as well as how the tradition of embracing other athletes considered outcasts such as John Carlos and Michael Sam is recognized around the sports world. In addition, Slayd will provide a brief analysis of the recent trade of PK Subban, the impact it had on our community and the possible legacy he will leave in the NHL, in spite of being a minority in a sport dominated by white men. He will conclude by taking questions. “Most of us are well versed in the incredibly rich history of Montreal sports,” says Slayd. “We are often reminded of the many memorable moments and the legendary figures that made them happen, from Maurice Richard to Gary Carter to Nadia Comăneci. However there is one athletic icon who towers above them all; not necessarily because of what he accomplished on the field of play but more for what he achieved by being there in the first place.” See the full press release and list of schools here. The programs begins on Tuesday, January 31 - Jackie Robinson's birthdate. BANCROFT CENTENNIAL: Bancroft Elementary School (4563 St. Urbain) in the Plateau will officially mark its 100th anniversary with a gala cocktail evening on Thursday, February 16 (6 pm to 8 pm) with performances and presentations by some of the teachers and students. Organizers wish to invite alumni, teachers and other former staff to attend. While the school officially turned 100 in September 2015, a committee was only recently put together to mark the Centennial. Event Coordinator Vanessa Langevin, the parent of a Bancroft student, notes that there will be rehearsals of a fashion show and a Bancroft historical display. In April 1911, the former Protestant School Board of Greater Montreal purchased a block of land on St. Urbain Street above Mount Royal Avenue with the expectation that within a few years it would be necessary to build a new school to relieve the overcrowding at two neighbouring schools - Fairmount and Mount Royal. During the 1913-14 academic year, the Board decided to prepare for the construction of a large school of the first class on this site, and plans were prepared accordingly. Bancroft Elementary School opened in September 1915 and was named in memory of Rev. Charles Bancroft, the first chairman of the PSBGM from 1846 to 1848. The building contained 29 classrooms, two Kindergarten rooms, a cooking centre for girls, a manual training (woodwork) centre for boys and a gymnasium, which could also be used as an assembly hall for the school. Bancroft opened at just the right time. Fairmont had 1,600 pupils and Mount Royal 2,000. When Bancroft did open it began life with an enrolment of 1,081 pupils in 26 classes drawn from the two schools- about 300 from Fairmount and 800 from Mount Royal. Principal Dorothy Ostrowicz points out that Bancroft is recognized as the “little school, with the big heart.” It presently has an enrolment of 270. That is a sharp rise from 2010, when the total number was 173. For more information contact Vanessa Langevin at vanessa@vanessalangevin.com. Among those expected to attend are prominent physicians and graduates Dr. Phil Gold and Dr. Mortimer Levy who met while in Grade 1 in 1942 and have remained close friends since that time. language, voice synthesizers, and adapted equipment for recreation and mobility. If you are interested in having your child/children attend the reverse integration program for a year please complete and submit two copies of the application either by mail or fax (514 485-7254) postmarked by February 13, 2017. Please note that children with special needs or IEP’s are not eligible to apply. Additional application forms are available at your school office or on the Mackay Centre School website. Please take the opportunity to learn more about our school and reverse integration program by visiting www.emsb.qc.ca/mackay. Children eligible to attend the reverse integration program will be invited for a two-day visit in March. At this time, applicants will be screened and selected based on individual class needs. Parents will be invited to attend an information meeting on the first day of their child’s visit. A tour of the school and the classrooms will be organized at that time. Info: Patrizia Ciccarelli, (514-482-0001, extension 1600) or Ms. Denise Maroun, Vice- Principal, at (514-482-0001, extension 1602). 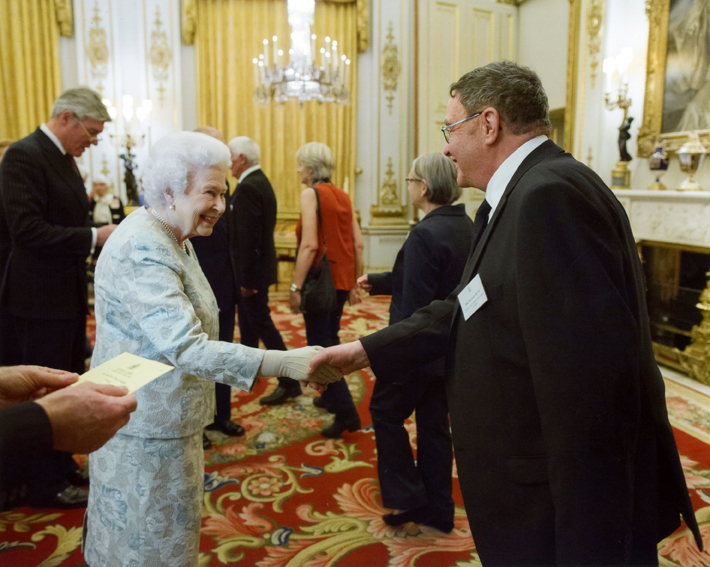 Richard Hunt meets the Queen. From 1985 until 1995, Mr. Hunt worked on re-writing the two main books used by the Society for their courses. The first is The Canadian Lifesaving Manual used in courses such as bronze medallion and bronze cross. He also worked from 1985 until 1994 on the book used for National Lifeguard courses called: Alert! Lifeguarding in Action. In 2004, the Society nominated Mr. Hunt to receive the Queen’s Golden Jubilee Medal for service to Canadians. Then, in 2016, he received word about the HRH Prince Michael of Kent Certificate of Merit. He travelled to London with his wife Doreen on November 22. He was thrilled to attend the awards ceremony, followed by the reception hosted by Her Majesty, Queen Elizabeth II. Prince Michael is the younger brother of the Duke of Kent. He is a first cousin of Queen Elizabeth II, and the second son of Prince George, who was the fourth son of King George V. Prince Michael is President of the Commonwealth Branch of the Society and Queen Elizabeth is patron of the Society. Mr. Hunt retired from teaching in 2008. At Rosemount High School he was in charge of the yearbook. Even in his retirement, he still volunteers with his wife to record school concerts and take pictures. Nathalie Cheff & Principal Nathalie Lacroix. STATIONARY BIKES: Nathalie Lacroix-Maillette, Principal at Royal Vale School in NDG, has equipped several classes with stationary exercise bikes. Research has shown that having access to such a tool allows students to self-regulate their emotions and helps them relieve their stress or anxiety. It allows students to exercise when they feel a need to move, which helps them increase their attention span. Of course, it is also a good way to exercise as several staff members who also have access to the bikes can attest to! Meetings have become an active affair with team members biking as they exchange pedagogical ideas! ROBOT MINDSTORM: Inspired by their robotics class with Avelino Morais, Royal Vale Cycle 3 students Oliver Kalin-Hadju, Andrew Hazen and Mekhi Wolfe have been working on building and programming a robot using an EV3 Mindstorm kit. Their robot detects objects both remotely and automatically with an infrared sensor. They can play games like laser tag with it. A spark of curiosity ignited at school has led to a full on passion beyond the classroom walls. Kayla Segal (second from the right) at Dunrae. school, Dunrae Gardens in Town of Mount Royal, to formally announce the establishment of the Kayla Segal Sports and Wellness Grant. Professionally Segal is a financial security advisor and independent life insurance broker. However, her passion remains competing in grueling triathlons across North America. 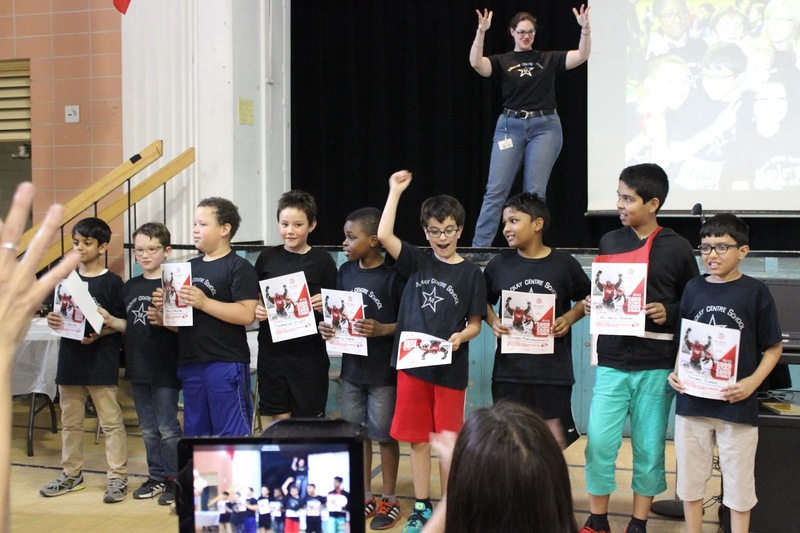 In order to support health and wellness programs in the EMSB, she has now embarked upon an initiative to offer a grant of $1,000 to one elementary school and $1,000 to one high school in need of support to launch a physical activity or wellness related project. She has undertaken various fundraising activities to raise the money. Projects may be related to increasing opportunities for participation in physical activity, promoting good nutritional habits, addressing mental health issues via sport and/or other wellness topics. Applicants must be a member of the school community (staff member, parent, volunteer) and have the Principal’s support for grant application and implementation of the proposed project. Funds may be used to purchase equipment, materials and supplies, or hire outside personnel. For complete details go to http://www.emsb.qc.ca/sportsandwellnessgrant. The deadline to apply is April 1. PEARSON GRAD: Lester B. Pearson High Schoo alumnus Amanda Abounader (right) was recently named co-captain of the Northland College Women's Hockey team. 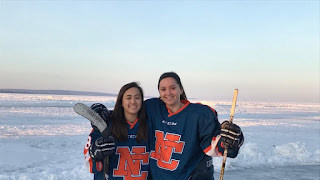 Amanda is considered the LumberJills' top defensemen and scored her first NCAA goal on December 10 at Bethel University. In the classroom, she has a 3.26 GPA. HOOKED ON SCHOOL: For the seventh consecutive year, schools across the EMSB will be participating in Hooked on School Week, set to run from February 13 to 17. The week, which is held every February, promotes school perseverance and intends to create a positive atmosphere for students.Throughout the year, the organization, which is comprised of 33 partners representing the education, community and business sectors, focuses on scholastic retention, making it a priority at schools throughout the province. Awareness campaigns, such as Hooked on School Week, have allowed students, family and communities alike to understand the value in education. Info: http://jembarque.ca. pleased to present many opportunities for teacher professional development during the months of October, November and December. In October, the days were organized by East and West Sectors. On October 21, ETS welcomed he teachers of the East Sector, both elementary and secondary, at Lester B Pearson High School. On October 28, LaurenHill Academy was the location of the workshops for the elementary and secondary teachers of our West Sector. 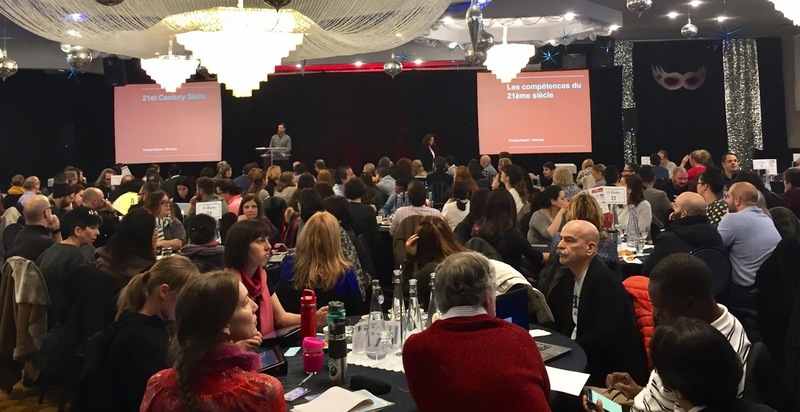 On these professional development days, a palette of over 50 workshops and learning opportunities was presented for over 650 teachers in attendance. Also on hand were in-school administrators and board administrators. During the online registration process teachers were asked to select two workshops per day. They were facilitated by educational consultants of the ETS Department, as well as external professionals from the Ministry of Education and other domains and fields of interest. In November and December, the ETS Department focused on the matter of Digital Citizenship. Four training days were organized by sector and level. The training took place in conference centres and the days were met with much appreciation from the participants. “This year we focused on home-grown talent!” said Ms. Galanogeorgos. 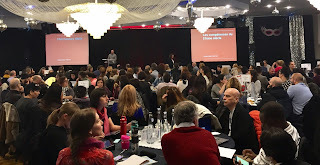 The presenters were all from Montreal and included presentations from our consultants on Digital Citizenship, our STEAM team and even legal matters from our board legal representative Lucie Roy." COMMUNITY ACTION PARTNERSHIP: Students from Vincent Massey Collegiate in Rosemount are kicking off 2017 by reaching out to neighbouring elementary students to develop, create and complete community action projects. The students will facilitate activities and discussions with the younger children while motivating them to create a project on topics such as unity, inclusion, respect and kindness. 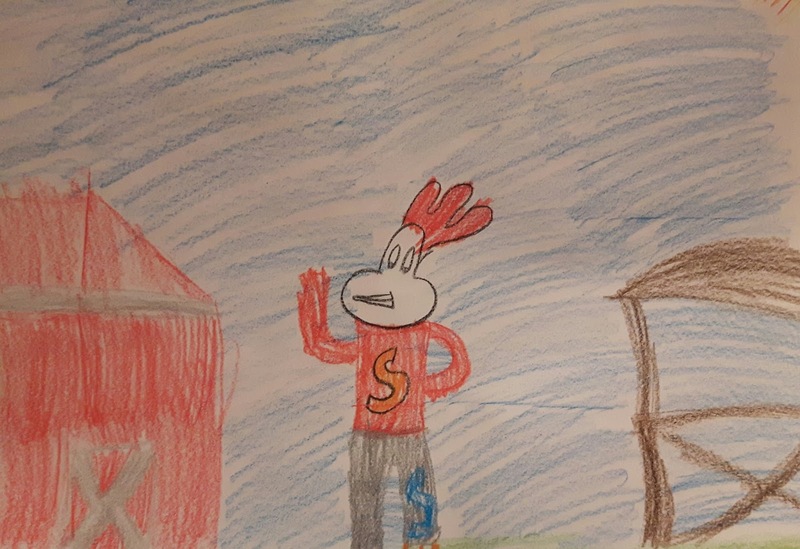 “On a weekly basis, the VMC students provide opportunities for the students to experience personal spiritual growth, facilitate social skill acquisition, cooperative learning and put virtues into action,” said Spiritual and Community Animator Rocco Speranza. “This project also helps the younger students improve their decision making skills as they are promoting the modelling of good citizenship.” This project is a partnership between Vincent Massey Collegiate and B.A.S.E. Daycare Services with the cooperation of Adriana Greenblatt, Equitas, Jennifer de Freitas and Rocco Speranza. Audrey Lacroix meets some Pompei students. POMPEI OUTREACH: As part of the program « Jouez Gagnant », an outreach initiative of the Équipe Québec program of the Ministère de l’Éducation, du Loisir et du Sport, students at Our Lady of Pompei School had the opportunity to meet Audrey Lacroix. She is a professional swimmer on the Canadian Olympic Team who talked about her career path, how it all started for her and how hard she worked to obtain her goal. She spoke about the benefits of sports and physical activity, but most importantly, about how her perseverance and ambition helped her achieve her dream. Her visit was an enriching moment for students, teachers and staff. Registration information, the schedules and rules of the games are accessible at www.sciencetech.ca under 15th Robo-JUNIOR (MORE), so schools can sign up. Click here for more details. The event is open to the public and admission is free. WESTMOUNT LEADERSHIP: The Leadership Class of 2017 along with Student Council and Prefects served over 1,500 breakfasts December 23 at Westmount High School during their annual Family Breakfast! SCOTIA BANK CHALLENGE: Join the team from the EMSB sponsored Inspirations Newspaper for the Scotia Bank Charity Challenge. Are you ready to get in shape for a great cause? Then join Team Inspirations on April 22 for the Scotia Bank Charity Challenge! Choose to sign up for a 5k walk, run or wheel (chair), a 10k run or 21k (April 23) run. This year’s event welcomes strollers on the 5k race, and a special children’s run. While one of our goals is to raise funds, we will also be team building, encouraging community support, having fun, getting in shape, and celebrating inclusive communities. Over 10,000 people participate in the event, making it an excellent opportunity for us to share Inspirations with the public at large. Funds raised will support programming for the special needs community. If you would like to register, contact Randy Pinsky at randyinspirations@gmail.com or call 514-483-7200 #7244. We will answer all of your questions regarding registration, and provide you with promotional codes to discounted registration fees. TEACHER SCHOLARSHIPS TO WASHINGTON HOLOCAUST MUSEUM: The Riva and Thomas O. Hecht Scholarship Program, Teaching of the Holocaust for Educators has announced an exciting new professional development opportunity for teachers. Applications are now being accepted for The Belfer National Conference for Educators at the United States Holocaust Memorial Museum July 19 to 21 for English Language Arts teachers and July 23 to 25 for Social Science/History teachers. The application deadline is March 31. All of the details can be found here. GOLDBLOOM ESSAY CONTEST: David Birnbaum, MNA for D'Arcy-McGee and Parliamentary Assistant to the Minister of Education and the Minister of Higher Education, has announced the second edition of the 'Victor Goldbloom Vivre Ensemble Essay Contest. Victor Goldbloom, the first MNA for D'Arcy-McGee, first Jewish Cabinet Minister in Quebec, first Minister of the Environment, passed away at the age of 92 last year. He also served as Canada's Commissioner of Official Languages. Dr. Goldbloom was a champion throughout his life of building bridges between English- and French-speaking communities and between those of diverse faiths. All Secondary IV and V students who live or study within the borders of the D’Arcy-McGee riding (Côte Saint-Luc, Hampstead and parts of NDG and Snowdon) are eligible. They are invited to submit essays of no more than 700 words on the general theme of “Vivre ensemble”. They are entirely free to choose their specific subject to address that theme. Entries can be submitted in English or French, but they must include a single-paragraph summary in the second language. Entries must be received no later than Friday, May 26th, 2017 at 4:00 p.m. at fran.gutman@assnat.qc.ca. MENTORSHIP PROGRAM: Imago Theatre, a 30 year old Montreal based theatre company, is currently accepting applications for their ARTISTA free theatre arts mentorship program for women between the ages of 16 to 21. The program provides empowering, community-building mentorship to 15 young women. Participants meet every Tuesday for 15 weeks and are offered free mentorship from theatre professionals, tickets to see Montreal theatre and the opportunity to create, collaborate and learn in a safe environment. ARTISTA culminates in a final outcome that is performed for the public. To apply to ARTISTA visit Imago Theatre's website here. www.imagotheatre.ca. An example of a submission. Melissa Tedeschi meets staff and students. Di Cesare demonstrated to teachers that a future career is not limited to working in a salon but that they can also pursue a wide range of careers in theatrics, film or editorials. 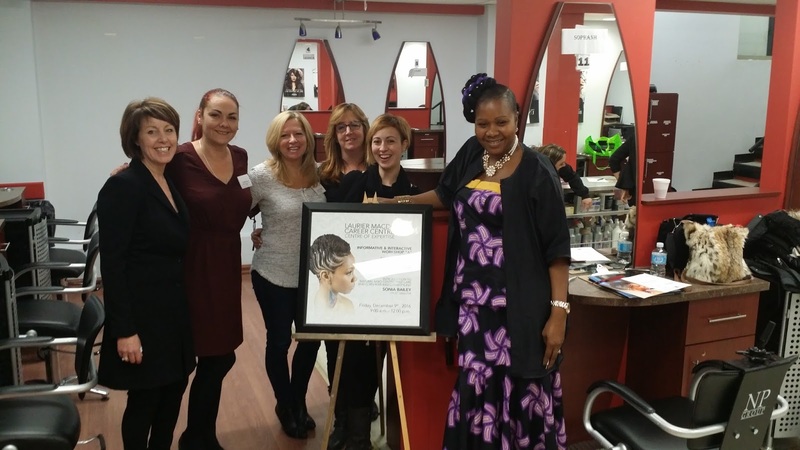 Furthermore, experts such as Termblay and Bailey demonstrated different approaches to hair, depending on ethnic backgrounds, which provided students with new skills and opportunities to develop niche hairstylists for certain groups. Melissa Tedeschi showcased her personal knowledge and talent in her domain as well as presented the extent of L’Oreal hair colors and the new advances in technology used by L’Oreal. THE BACHELOR CONTESTANT: Vanessa Grimaldi, a 29 year old special needs teacher at the Galileo Adult Education Centre, remains one of the contestants on ABC’s top-rated reality TV program The Bachelor. Here is an interview she gave to Glamour Magazine. INSCRIPTION À LA MATERNELLE: La CSEM a annoncé que la semaine d’inscription à la maternelle pour l’année scolaire 2017-2018 se tiendra du lundi 6 février au vendredi 10 février. Si un enfant est déjà inscrit à une école en particulier, ses frères et sœurs pourront s’inscrire une semaine plus tôt. Nous demandons aux parents d’inscrire leur enfant à l’école primaire de la CSEM la plus près de leur domicile où le programme en français de leur choix est offert. Pour de plus amples renseignements, veuillez composer le 514 483-7200, poste 3672 ou visitez le site Web de la Commission au www.emsb.qc.ca. Si vous inscrivez votre enfant pour la première fois, vous devrez fournir son certificat de naissance et son carnet de vaccination à l’école qu’il fréquentera. Les parents devront remplir des formulaires afin de permettre à l’école en question de présenter une demande de certificat d’admissibilité à l’enseignement en anglais. En vertu de la Charte de la langue française, un certificat d’admissibilité est généralement accordé aux enfants qui ont reçu la majeure partie de leur enseignement primaire ou secondaire en anglais au Canada, dont la mère ou le père a reçu la majorité de son enseignement primaire en anglais au Canada ou ceux dont le frère ou la sœur a reçu la majorité de son enseignement primaire ou secondaire en anglais au Canada. Veuillez prendre note qu’en raison de la législation qui régit les langues, ce critère exclut les études complétées dans une école privée au Québec. STIAM PREND SON ENVOL: La Commission scolaire English-Montréal a annoncé son intention d’étendre à plus grande échelle son projet pilote STIAM qui connaît un vif succès, vantant les mérites de cette approche comme voie d’avenir pour l’enseignement des sciences. Le programme STIAM (sciences, technologies, ingénierie, arts et mathématiques) est une initiative multidisciplinaire qui vise à favoriser la créativité chez les élèves ainsi qu’une participation poussée de leur part dans la réalisation d’une série de projets de groupe, en abordant non seulement les cinq matières enseignées à l’école mais aussi en rendant ces projets plus pertinents, plus créatifs, plus intéressants et davantage axés sur la découverte. STIAM est une approche pédagogique ayant pour objectif de promouvoir un esprit inquisiteur, un raisonnement logique et des compétences en matière de collaboration. Pour l’année scolaire 2016-2017, la mise à l’essai réussie de ce projet pilote est en cours dans deux écoles primaires : Général Vanier à Saint-Léonard et Pierre Elliott Trudeau à Rosemont. La présidente de la CSEM, Angela Mancini, a annoncé qu’au moins une douzaine d’écoles souhaitent adopter le programme STIAM dès l’an prochain. La CSEM a également invité des experts dans les domaines des sciences, des technologies, de l’ingénierie, des arts et des mathématiques à agir à titre d’ambassadeurs officiels du programme STIAM. Ces derniers ont accepté de rendre visite aux classes STIAM de la CSEM afin de partager leur expérience. Fort populaire en Chine, en Inde et aux États-Unis, le programme STIAM stimule la participation active des élèves, par essais et erreurs, à une série de projets interactifs qui intègrent les cinq disciplines d’enseignement auxquelles réfère l’acronyme STIAM, et ce, en utilisant des dispositifs technologiques de pointe et du matériel de construction des plus élémentaires. Ces projets contribuent à créer une dynamique de groupe parmi les élèves où ils sont appelés à travailler ensemble à la conceptualisation, la communication, la collaboration et la construction dans des situations authentiques que leur fournit leur enseignant. Ensemble, ils déterminent comment les choses fonctionnent en posant des gestes, en faisant appel en classe à une approche plus fidèle à la réalité. Par conséquent, les projets STIAM favorisent non seulement la communication, la conceptualisation et la collaboration, mais aussi la curiosité, la créativité et l’esprit critique. Au cours de la période pilote, la CSEM a désigné trois de ses conseillers pédagogiques afin qu’ils agissent à titre de leaders STIAM pour les deux écoles mentionnées précédemment. Il s’agit de Sara Iatauro, conseillère en sciences pour les écoles primaires; Nicolas Doyon, conseiller en arts; et Chad Leblanc, conseiller en mathématiques au niveau primaire. Chaque semaine, ils rendent visite aux deux écoles où ils animent des exercices STIAM avec les élèves et discutent des rouages du programme avec les enseignants et les directions d’école. Pour de plus amples renseignements, nous vous invitons à lire le communiqué de presse et à visiter le www.emsb.qc.ca/steam. AMBASSADEURS STIAM: Lors d’une conférence de presse tenue à l’école Général Vanier et mettant en vedette le programme STIAM, Marc Garneau, ancien astronaute, ministre fédéral actuel des Transports et député libéral de la circonscription NDG-Westmount, figurait parmi les ambassadeurs STIAM. Des météorologistes de plusieurs médias qui font appel aux sciences et aux arts dans l’exercice de leurs fonctions étaient également du nombre : Lori Graham (CTV), Anthony Farnell (Global TV), Eramelinda Boquer (CJAD), Sabrina Marandola (CBC) et Catherine Verdon Diamond (Breakfast TV). D’autres ambassadeurs de ce programme étaient aussi sur place à cette occasion : Annie Savard, Université McGill (Mathématiques); Steven Dada, étudiant en ingénierie à l’Université McGill; le producteur et directeur Anthony Di Verdis; Nicole Bucci, agente de distribution artistique; Kathryn Westoll et Mike Payette des Productions Geordie Theatre (Arts). LEARN MET LA MAIN À LA PÂTE: Le Leading English Education and Resource Network (LEARN) est un organisme sans but lucratif qui dessert principalement les réseaux public et privé regroupant les anglophones, les autochtones, ainsi que les secteurs des jeunes et de l’éducation des adultes au Québec. Il combine l’expertise et la collaboration des enseignants, élèves, parents et partenaires de notre communauté en vue de favoriser la réussite de tous les apprenants. LEARN a joué un rôle déterminant en appuyant la CSEM pour piloter le programme STIAM. L’un des principaux objectifs des espaces créatifs de LEARN et de l’initiative STIAM vise à aider les enseignants à encourager les élèves à s’investir grâce à l’apprentissage actif à l’aide de matériel hautement technologique et traditionnel. Il peut s’agir notamment de programmation grâce à des microcontrôleurs, de robotique, de fabrication avec du carton, d’activités avec du textile électronique et des circuits papier, de même que de conception et de création de machines simples. Mais en tout premier lieu, nous mettons l’accent sur la conception, la création et la collaboration, ainsi que sur la mentalité de fabrication. Ce n’est pas tant le produit qui importe mais plutôt l’apprentissage qui se fait tout au long du processus et la réflexion sur cet apprentissage, aussi bien pour les enseignants que pour les élèves. Nous vous invitons à consulter l’intégral du communiqué de presse. GÉNÉRAL VANIER: Il y a environ un an, Sandra Furfaro, directrice des Services éducatifs et de la technologie à la Commission scolaire English-Montréal, proposait à l’école primaire Général Vanier de Saint-Léonard de mettre à l’essai un nouveau programme éducatif pratique en tant que projet pilote pour lui permettre de faire son entrée dans le 21e siècle. « Lorsque j’ai entendu parler de STIAM la première fois, j’ai voulu qu’on passe rapidement à l’action pour obtenir l’approbation de tout le personnel de l’école », a précisé Joseph Schembri, directeur de l’école Général Vanier. « J’ai d’abord proposé l’idée au conseil du personnel qui, à son tour, l’a présentée à l’ensemble des employés qui se sont prononcés unanimement en faveur de cette initiative. Nous l’avons ensuite soumise au conseil d’établissement de l’école qui, lui aussi, a approuvé à l’unanimité la mise à l’essai du programme STIAM au sein de notre école. » M. Schembri est convaincu qu’au terme de la période d’essai au printemps prochain et à la suite d’une évaluation qui sera effectuée par l’école, ce programme sera maintenu dans son établissement. Il a également bon espoir que le succès remporté par STIAM à l’école Général Vanier, jusqu’à présent, se traduira par une hausse du nombre d’inscriptions. Nous vous invitons à consulter l’intégral du communiqué de presse. ÉCOLE TRUDEAU EN PLEIN ESSOR: Dès qu’on entre à l’école primaire Pierre Elliott Trudeau de Rosemont, le programme STIAM est omniprésent. Que ce soit dans le laboratoire ouvert ou encore dans les salles de classe, l’école bourdonne sans cesse d’activité. Les élèves s’affairent avec enthousiasme à différents projets ou accomplissent des exercices en lien avec le programme STIAM (sciences, technologies, ingénierie, arts et mathématiques). « Ce qui est génial avec STIAM, c’est que les élèves apprennent à se responsabiliser et à travailler en équipe », a déclaré Jennifer Lacroix, enseignante de 6e année. « Ils apprennent aussi à résoudre des problèmes, à s’investir et à prendre des risques, si bien qu’ils peuvent tenter de 500 façons différentes de trouver une solution. Mais surtout, ils acquièrent à un jeune âge les compétences essentielles pour évoluer dans le monde de demain, puisqu’on ignore le type d’emplois qui s’offriront à eux lorsqu’ils feront leur entrée sur le marché du travail. » Mme Lacroix a souligné que depuis la mise en œuvre du programme STIAM à l’école Pierre Elliott Trudeau en septembre dernier, les réactions des élèves à l’égard de cette initiative et du laboratoire ouvert ont été très positives. « Ils sont enthousiastes chaque fois qu’ils se rendent au laboratoire ouvert », a-t-elle précisé. « J’adore voir le grand sourire qui illumine leur visage lorsqu’ils complètent les exercices; ils ont ainsi l’occasion de donner libre cours à leur créativité et de trouver par eux-mêmes des solutions grâce à des activités pratiques. » Nous vous invitons à consulter l’intégral du communiqué de presse. MOIS DE L’HISTOIRE DES NOIRS: Pour souligner le Mois de l’histoire des Noirs en février à la CSEM, le rappeur Annakin Slayd animera dans certaines écoles une série d’exposés portant sur le légendaire joueur de baseball Jackie Robinson et sur la ville de Montréal. Jackie Robinson est celui qui a fait tomber la barrière de la couleur dans le baseball professionnel. Annakin Slayd est le nom de scène d’Andrew Farrar qui a grandi à Chomedey et est diplômé de l’école secondaire Western Laval en 1995. Il a collaboré, en 2011, à la campagne marketing « Go Publique » avec l'Association des commissions scolaires anglophones du Québec où il a produit et dirigé une vidéo musicale, et en a été la vedette, dans le but de faire augmenter le nombre d’inscriptions. À chacune des écoles qu’il visitera, Annakin présentera un exposé d’environ 50 minutes comportant trois volets et dont le point culminant sera le visionnement du reportage produit par la chaîne télévisée PBS Mountainview « Jackie Robinson’s Montreal Connection » ainsi que sa vidéo à succès avec la chanteuse Leesa Mackey. Il présentera des photos et des vidéos de Jackie Robinson, soulignera ses réalisations dans le monde du baseball et au sein du mouvement en faveur des droits civiques, se penchera aussi sur son passage à Montréal et son héritage qui perdure encore aujourd’hui dans la métropole. Il s’entretiendra sur la perception de la tradition d’accueillir d’autres athlètes dit rejetés, tels John Carlos et Michael Sam, dans l’univers du sport. De plus, il présentera une brève analyse de la récente transaction impliquant PK Subban et de son impact sur notre communauté et l’éventuelle marque qu’il pourrait laisser dans la LNH, malgré le fait qu’il soit minoritaire dans un sport dominé par les Blancs. Il terminera par une période de questions. « La plupart d’entre nous connaissons bien l’histoire incroyablement riche du sport à Montréal », a indiqué Annakin. « On nous rappelle souvent les nombreux moments mémorables qui ont marqué cette ville et les personnages légendaires qui y ont laissé leur trace, qu’il s’agisse de Maurice Richard, Gary Carter ou Nadia Comăneci. Or, force est d’admettre qu’une icône sportive s’élève au-dessus de toutes, pas nécessairement pour ses exploits sur le terrain, mais pour ce qu’il a accompli par son unique présence. » Nous vous invitons à lire l’intégral du communiqué et à consulter la liste des écoles ici. De 1985 à 1995, M. Hunt a participé à la réécriture des deux principaux manuels de cours utilisés par la Société. Le premier, le Manuel canadien de sauvetage, est utilisé notamment dans les cours Médaille de bronze et Croix de bronze. Il a également collaboré, de 1985 à 1994, à la rédaction du manuel utilisé pour les cours de sauveteur national et intitulé Alerte : La pratique de la surveillance aquatique. En 2004, la Société a désigné M. Hunt pour être récipiendaire de la Médaille du jubilé de la Reine en reconnaissance des services rendus aux Canadiens. En 2016, il a appris qu’on allait lui décerner le Certificat de mérite HRH du prince Michael de Kent. Il s’est alors rendu à Londres en compagnie de son épouse Doreen, le 22 novembre dernier. C’est avec beaucoup d’enthousiasme qu’il a assisté à la cérémonie de remise des prix, suivie d’une réception donnée par Sa Majesté la reine Élizabeth II. Le prince Michael est le frère cadet du duc de Kent. Il est cousin germain de la Reine Élizabeth II et le deuxième fils du prince George, lui-même quatrième fils du roi George V. Le prince Michael est président de la filiale du Commonwealth de la Société et la Reine Élizabeth en est le mécène. M. Hunt s’est retiré de l’enseignement en 2008. À l’école secondaire Rosemount, il était en charge de l’album des finissants. Même à la retraite, lui et son épouse se portent encore bénévoles pour enregistrer les concerts à l’école et prendre des photos. PROGRAMME DE PERSÉVÉRANCE SCOLAIRE: Pour une septième année consécutive, les écoles de la CSEM prendront part à la Semaine de la persévérance scolaire qui se tiendra du 13 au 17 février. Chaque année, cette activité vise à promouvoir la persévérance scolaire et créer un environnement positif pour les élèves. Tout au long de l’année, l’organisme, composé de 33 intervenants provenant des secteurs de l’éducation, communautaire et des affaires, met l’accent sur la persévérance scolaire et en fait une priorité dans toutes les écoles de la province. Des campagnes de sensibilisation telle la Semaine de la persévérance scolaire ont permis à des élèves, des familles et des communautés de saisir toute l’importance des études. Pour de plus amples renseignements, visitez le http://jembarque.ca. VÉLOS D’EXERCICE: Nathalie Lacroix-Maillette, directrice de l’école Royal Vale à NDG, a équipé plusieurs classes de vélos d’exercices. Les recherches démontrent que les élèves qui ont accès à un tel équipement parviennent à autoréguler leurs émotions et à diminuer leur stress ou leur anxiété. Ils ont la possibilité de faire de l’exercice lorsqu’ils ressentent le besoin de bouger, ce qui les aide à améliorer leur capacité d’attention. Et bien entendu, il s’agit aussi d’un excellent moyen de faire de l’exercice, comme sont à même d’en témoigner plusieurs enseignants qui ont eux-mêmes accès à ces vélos! Les réunions sont désormais plus actives que jamais alors que les participants pédalent tout en échangeant des idées pédagogiques! The next Focus will be published on Thursday, February 23. Deadline for submissions is Friday, February 17 at Noon.